The Town of East Duke: "The Tale of Two Cities"
by Betty Jo McKibbin, Duke, Oklahoma. Presented at Duke Centennial, May 1989. 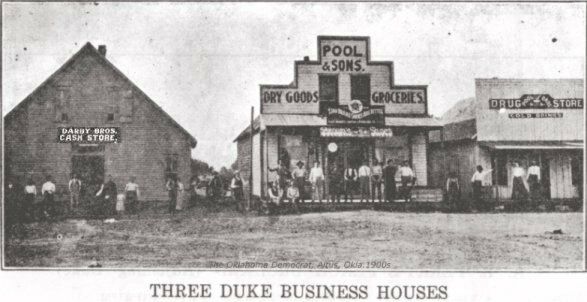 The colorful history of the Duke community began in 1887 when Mr. and Mrs. A. L. Perry settled on land located twelve miles west of Altus near the banks of Turkey Creek. Mr. Perry and his brother-in-law, Chauncey Phelps, established a general store to serve the settlers moving into the area. This location later became known as West Duke in Old Greer County, Texas. * Duke was named by Mrs. Perry in honor of Judge F. B. Duke who was the federal judge in Mangum. The first child born in the new community caused quite an interest. Her name was Bessie Phelps. On September 11, 1890, an application was completed requesting that he area be granted a post office. The charter was issued and A. L. Perry was designated as the first postmaster. He held that position for the following 18 years. A school was operating in the community by 1898. Miss Dora Stewart served as the first superintendent. As the years passed, the Duke community began to grow. A gin and grist mill were two of the earlier institutions. Hotels, barber shops, and even a bank were soon visible in the town. The construction of the railroad from Altus to El Paso, Texas, was very important to the growth of the area. This line passed directly through the Duke settlement. Duke was platted September 18, 1906. 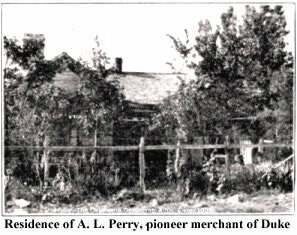 And in 1910, Mr. Perry sold his business to the Darby brothers and entered into the real estate ventures. During this time, a new townsite was platted about a quarter-mile east of the old location. However, deep feelings of animosity developed between the inhabitants of the two areas. Of course, each citizen had to choose between either the old town or the new town. Many disagreements resulted which ended in fist fights, and some homes and businesses were even burned to the ground. A large advertisement appeared in the Altus Weekly News which advocated the "obvious" benefits of the Old Town location. Only five of the existing twenty-six businesses had planned to move to the new site, and the inviting advertisement had made it appear that the Old Town was booming. The Methodist and Baptist Churches, the post office and bank planned to remain in Old Town. But, when the railroad line through Duke ws completed on June 9, 1910, the new site looked very appealing. The company decided to build their depot there, however, the Old Town residents remained determined to keep their town. A large fire in 1910 resulted in severe damage to the new town. The fire fighting equipment was archaic and the fire had quickly raged out of control. The New town was devastated by the losses of such businesses as The Duke Times; Holler and Render, Real Estate and Insurance; Darby Brothers, Hardware and Groceries; the Post Office in Darby's Store; Pool & Sons, General Merchandise; McKibbin's Billiard Hall; and McCauley's Hotel. Temporary quarters were offered for these businesses until new buldings could be constructed. The citizens of East and West Duke feuded over a bond election to build a new school for the community. Each side wanted the school built in their area. The first election failed, but the second one passed, and the citizens voted to locate the school in the New Town. The rivalry became so intense that the railroad was forced to relocate the depot to the half-way point between the two towns. The Methodist Church did the same. This half-way point was called "No Man's Land." Five years passed before the feud was finally settled. In August of 1912 the "hatchet was buried." As the town bands performed, the people shouted with joy as a horse-drawn hearse approached the area now occupied by the bank near Main and Broadway. A bloody hatchet which symbolized all the division between the neighboring towns was the passenger in the slow moving hearse. A grave was excavated and the hatchet, which had been painted red, was buried in a solemn ceremony. After the speeches were offered and the ceremony was completed, Shaker Kouri, who represented the Old Town, and A. L. Perry, who represented the New Town, shook hands over the grave of the hatchet and the long dispute had ended once and for all. A provision of the "peace treaty" stated that the New Town would provide free lots to citizens who moved from Old Town. Soon, the site of the original town was deserted. Only the cement structure of the old water reservoir remains of the Old Town. It is located in the western outskirts of present-day Duke. The official name of the town is East Duke. 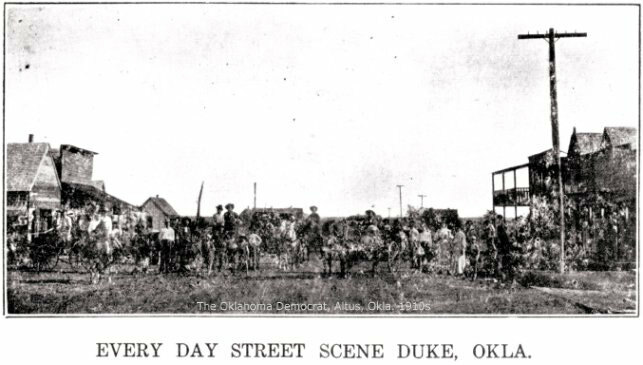 *Duke was founded in Greer County, Texas, changed March 16, 1896 to Greer County, Oklahoma Territory, again November 16, 1906 to Jackson County, Oklahoma. Duke in 1927 "Who's Who in Jackson County"
Situated on the line of Altus, Roswell and El Paso Railway, 15 miles west of Altus, Duke was platted Sept 28, 1906 and moved to the present location in 1910. It was named for Judge Duke, who was then judge at Mangum. The population was about 600.
Business firms in Duke in the year 1927 included a bank, two dry goods stores, four grocery stores, one department store (consisting of hardware, furniture and undertaking, dry goods and notions), two drug stores, one meat market, one hotel, three restaurants, two grain, feed and poultry houses, one lumber yard, four coal dealers, one elevator, three cotton gins, two blacksmith shops, three barber shops, one cleaning and pressing establishment, two garages and five filling stations. The principal crops were cotton, wheat, oats, corn, kaffir, maize, and sorghum. Annual count of cotton bales was 7,500. There was good road through Duke by way of State Highway 7. The M. K. & T. railroad had two passenger cars passing through Duke daily. They had a good water system from a deep well, and "S. W. Highline" water system. Five churches provided spiritual comfort in Duke in 1927 including Baptist, led by Rev. W. L. Nelson, pastor; Methodist, led by Rev. C. T. Simmons, pastor; Christian, led by Bro. E. L. Elkins, pastor. There was a Society building where Masons, Odd Fellows and Woodmen of the World met. Duke's 1927 school system under leadership of J. W. Dungan, superintendent, and had a faculty of 10 instructors and an enrollment of 400 students. The town was governed by a board of trustees witth Bill Allen, secretary of chamber of commerce and city officers: G. W. Marshall, J. H. Nance, and A. Dickenson. A. L. Perry, the founder of Duke, was the first president of the bank and active builder in town and community. Other pioneers were S. E. Presley, Billy Paine, John Martin, S. T. Beck, Mr. Hydrick, Charlie Hester and Mr. Echos. Busy citizens and businessmen of 1927 were J. H. Absher, Bill Allen, L. R. Anderson, H. W. Bailey, Claud Brown, Tom Buchanan, W. M. Cunningham, B. E. Darby, R. L. Darby, S. J. Davis, Mrs. Susie Edge , Hugh Garrison, Cloyce Guess, C. W. Hessler, Marvin Haley, R. B. Haney, T. H. Kissiar, R. H. Mall, Frank Marshall, Farris Massad, Dr. R. H. Mays, A. E. Middleton, C. W. Middleton, Mrs. N. E. Moore, J. H. Nance, A. L. Perry, John T. Peterson, W. M. Petterson, C. Presley, M. C. Rose, J. L. Settle, W. H. Thompson, Lelia Walker, Delmer Woods, and J. A. Warren.